Thirteen-year-old Brian Robeson is on his way to visit his father when the single engine plane in which he is flying crashes. Suddenly, Brian finds himself alone in the Canadian wilderness with nothing but his clothing, a tattered windbreaker, and the hatchet his mother has given him as a present -- and the dreadful secret that has been tearing him apart ever since his parents' divorce. But now Brian has no time for anger, self-pity, or despair -- it will take all his know-how and determination, and more courage than he knew he possessed, to survive. In the fourth grade my teacher decided that she wanted to have 'reading time' with us at the end of the day for at least 20 minutes if we finished our work on time. Looking back now I think that it may have been kind of a way to bribe us to work hard and behave in class. The first day of reading time my favorite teacher I've ever had the privilege to be taught by pulled out Hatchet and told us it was one of her favorite books to read as a teenager back in the eighties. Of course many jokes from classmates ensued. Those twenty minutes at the end of everyday were so magical for me and really sparked my appreciation for the written word. Hatchet is a story about survival and the strength and greatness of the human spirit. Brian is a character I think many people can relate to. While reading this book you can't help but wonder what you would do if put into Brian's shoes. Would you have been smart enough to think of that? Would you do the same thing if in such a desperate situation? Would you give up or keep going no matter how hard it got? In the beginning of the story Brian is traveling to go visit his father since his parents have recently divorced. I actually began reading this book on the airplane that was taking me to my dad's since I'm kind of in the same boat as Brian. 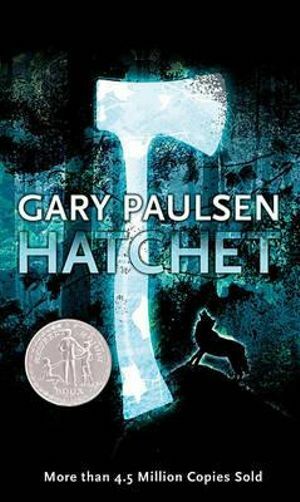 It's obvious that Gary Paulsen had done a lot of research to write this book, and after the story he talks about how he put himself through forced-falls and left stranded in the woods to fend for himself. That just goes to show how passionate he was about getting into the right mindset to write Hatchet, and I have a great appreciation for writers that will put themselves in their characters shoes so that they can get the emotions and feelings spot-on. Hatchet is just as amazing to me now as it was back in the fourth grade, almost over ten years later. It's no wonder it's an American classic, it gets your imagination running wild. My wonderful fourth grade teacher only got to read half of the second book to us by the time school was out, and I found out there are five books in the saga. I'm definitely going to continue reading Brian's story in The River. Thank you Mrs. Wolf for being such an amazing 4th grade teacher.